No I am not talking about the movie Ratatouille, but wasn't it cute? Anyway, I am all about quick and healthy meals. I don't like to cook but if I have to I want it quick and simple. I get all sorts of magazine and thumbing through one of them I saw this quick ratatouille recipe that I think even I can cook. It fits int the category of quick healthy dinner ideas. So part of my new food friday post here is the recipe. Heat oil in large lidded skillet on medium heat. Add onion and sautee for 5 min. Add garlic, eggplant, and red pepper. Cover and cook for 10 min. 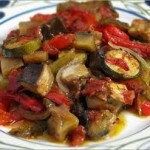 Mix in tomatoes, zucchini, and thyme. Cover again and cook for 12 minutes. Stil in beans, parsley, salt, and pepper. Heat through. Makes 4 servings. Sever with polenta for a healthy option. Do You have quick healthy dinner ideas or quick healthy breakfast ideas? If you are interested in being featured for new food Friday please contact me.